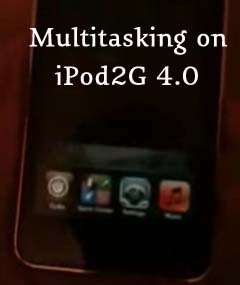 Even though Apple says iOS 4.0 multitasking will not be supported on iPhone 3G & iPod Touch 2G, the iPhone jailbreak already workout to bypass that restriction. In past we had reported how easy is to activate multitasking on iPhone 3G but the only criteria is to have jailbroken iPhone 3G 4.0. In another tweet iH8sn0w also mentioned Springboard Background wallpapers can also be set in the iPod2G. Further details on iPod Touch 4.0 jailbreak are yet to be published. Have patience till iOS 4.0 final is released on June 21st. so i upgraded? my ipod to ios4 and the jailbreak enabled the back ground, the percentage battery, and the multitasking. nut i cant seem to get any app to be on in the background. like if i go in to cydia close out of it i double click the home button the mulitasking comes up but theres nothing in it. help!! !